Ring in the New Year with these incredibly moist and delicious Mini Rum Cakes! They are easy to prepare and the unique flavor will have your friends and family begging you for more! They go well with a tall glass of champagne or a strong hot cup of coffee. What are you waiting for, get making these now! This tried and true recipe was once a large bundt cake, but in spirit of my love of “mini” desserts, I converted them into absolutely divine Mini Rum Cakes. 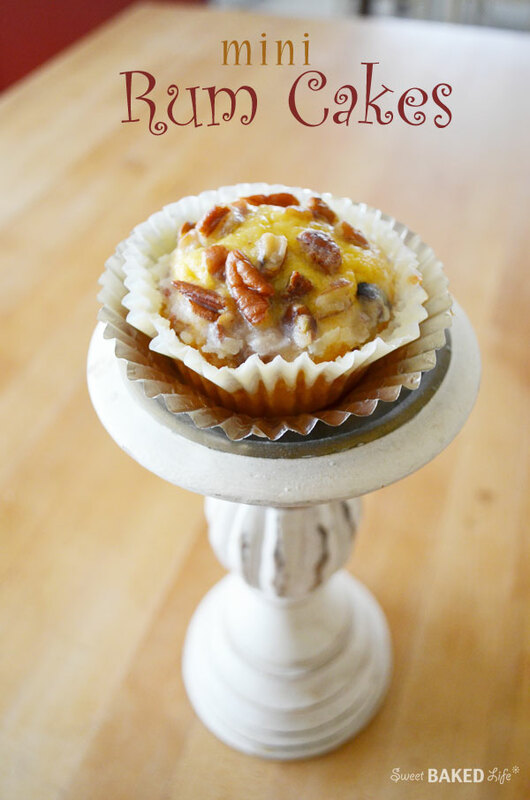 These tasty morsels consists of a fluffy yellow cake, infused with rum, topped with crunchy pecans, and doused with a sweetened rum glaze. Need I say more? Heat your oven to 350 degrees. Prepare muffin tins with paper or foil liners (I used 2-12 cup tins) and set aside. Mix all cake ingredients together (except for the nuts) and pour batter into prepared tins, filling about 3/4 full. 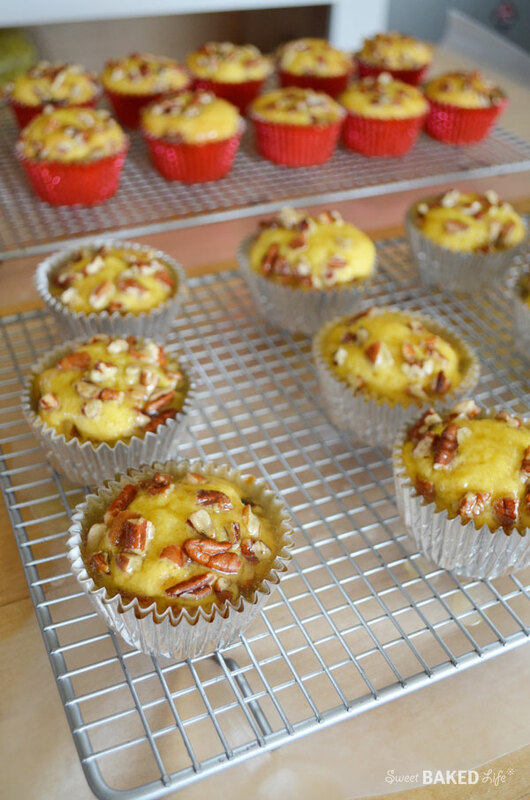 Sprinkle the chopped pecans on top of each one and bake for about 20-25 minutes or until done. Cool for about 10 minutes, then place muffins on wire rack with wax paper on bottom to cool completely. For the glaze, put the butter in a medium-sized heat-proof bowl and microwave on high for about 30-45 seconds until completely melted. Add the water and sugar to the bowl and microwave for about 1 minute 30 seconds. Remove from oven and stir in rum. Prick the tops of the cakes with a toothpick. Spoon the glaze evenly over the tops of the cakes. Allow cakes to absorb the glaze. Repeat until glaze is all used up. These Mini Rum Cakes will melt in your mouth — and are the perfect little dessert to serve to your guests to celebrate a big night. Thanks Melisa! Happy New Year! Wow! Thank you so much! Happy New Year! I’ve gotten these as presents but never knew how to make them. Now i know, sounds delish!